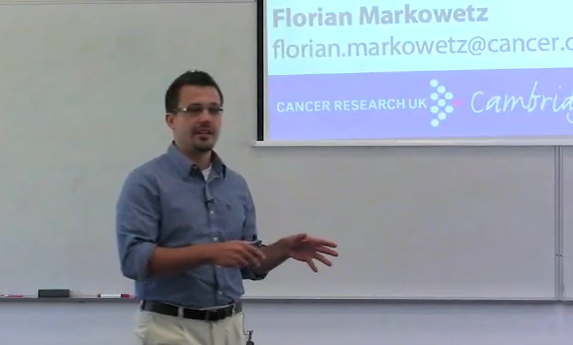 Florian Markowetz is a Senior Group Leader at the Cancer Research UK Cambridge Institute. He is a Royal Society Wolfson Research Merit Award holder and received a CRUK Future Leader in Cancer Research prize. He holds degrees in Mathematics (Dipl. math.) and Philosophy (M.A.) from the University of Heidelberg and a Dr. rer. nat. (PhD equivalent) in Computational Biology from Free University Berlin, for which he was awarded an Otto-Hahn Medal by the Max Planck Society. His group at the CRUK Cambridge Institute combines computational work on cancer evolution and image analysis of the tumour tissue with experimental work on understanding key cancer mechanisms like the estrogen receptor. If you are interested in working with Florian, please read the guide for applicants. Computational Biology: Dr. rer. nat. I collect scientific B-sides on my blog. Otto Warburg Internat. Summer School 2007 on Computational Systems Biology: talk 1, talk 2. Member of the International Society for Computational Biology (ISCB) and the Institute for Mathematical Statistics (IMS).